In season 18-19 the cosmos is at the heart of the Concertgebouw Brugge’s cultural universe. After a year of metamorphoses, in which we focussed on ‘the gaze turned inward', our new season looks upward and outward. We search for connections between music, dance and science, and reveal surprising links. Season’s Thinker Thomas Hertog: KULeuven cosmologist and friend and close associate of the recently deceased Stephen Hawking. Season’s Composer Annelies Van Parys: this daughter of Bruges is one of our country’s leading composers of contemporary classical music, with an exceptional love of spectralism - music inspired by the physical properties of sound. Season’s Photographer Dries Segers: his photos grace the season brochure, and all without the aid of a camera, because Segers prefers to treat film and then expose it to light, space and time. The result is a perplexing almost alien spectacle. This season’s theme is so inspirational that the Concertgebouw is organising a special Cosmos Festival, from 26 March to 10 April, 2019. The programme highlights, in every possible way, the often strong connection between art and science. Scientist Thomas Hertog and cellist Arne Deforce reveal the analogy between music and the cosmos in a unique lecture. 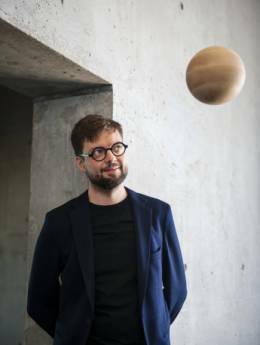 Artist Karl Van Welden presents his project United Planets, which features works inspired by the planet Mars. Valery Vermeulen and Hiroshi Matoba present a new audiovisual production, in which they convert data from outer space into music and visuals. And the famous orchestral suite The Planets is provided with impressive NASA images. SLOW(36h) – from 22 February to 24 February, 2019: slowness and minimalism are central here. Among other things, there is a performance of Bach's Cello Suites with ‘time-related’ interventions by Gerard Bodifée, Edel Maex, Joke Hermsen and others. Many activities are planned around the Astrid Park: from a 24-hour radio broadcast from Villa Bota, to tea ceremonies and tai chi in the Magdalene Church. On a visual trail through the Concertgebouw, we discover video art by Sigur Rós (among others). Sidi Mounir Quadiri Boutchich, performs hypnotic Sufi chants. And resident artist Anne Teresa De Keersmaeker takes us on a Slow Walk from the four different gates of the Bruges ring road to the Markt. Jazz Brugge – from 16 November to 18 November, 2018: three-day jazz festival, in collaboration with CAPE. With its theme of Crossing Cultures, Jazz Brugge becomes a beautiful mix of influences from West and East and North and South, with big names and up-and-coming talent. The festival opens with a W.E.R.F. label night, to celebrate the 25th anniversary of this unique jazz label. December Dance – from 06 December to 16 December, 2018: this year with a geographic focus on Australia. Bach Academy Bruges – from 15 January to 20 January, 2019: with the theme Heaven on Earth. Budapest Festival – from 16 May to 18 May, 2019: built around romantic symphonies, with a surprise as its festive closer – the audience get to select the programme. In season 18-19 the Concertgebouw presents five new Masterpieces: five highpoints of music history that you have to hear live at least once in your lifetime. Plus a comprehensive programme of participatory projects (in collaboration with Musica) and in-depth context activities. In season 18-19 Concertgebouw Brugge’s five resident artists all present new projects to the (Bruges) audience. Rosas / Anne Terese De Keersmaeker: a whole week of celebration (in collaboration with CC Brugge and KAAP) to mark Rosas’ 20th production in Concertgebouw Brugge, featuring the six Brandenburg Concertos – a total of six unique performances! Anima Eterna Brugge: three projects: Mozart Symphonic (benefit concert for FOTON), the chamber music of Schubert & Berwald, and an orchestral project focussed on Mahler & Brahms (in collaboration with baritone Thomas Bauer). Nadar Ensemble: two new productions: Rauschen – in which the audience can wander freely among the musicians – and Vox Angeli – in which Bernhard Lang adds a new work to the Angel Series (to accompany Luc Tuymans’ Angel mural). Nadar Ensemble also participate in next season’s Dating the Artist adventure. ECCE: as part of Bach Academy Bruges, ECCE present the new production Flowers (we are), in premiere. Vox Luminis: three special projects: In March we celebrate this early music vocal ensemble’s 15th anniversary. There is also the start of the multi-year project Florilegium Portense, during which Vox Luminis will publish, perform and record that entire 17th-century music collection. And, as part of the Masterpiece Weeks, they will also perform Charpentier’s Te Deum. In season 18-19, the Concertgebouw will devote even more attention to children and families. New is Atelier Matinée: every first Sunday of the month (from October 2018 to June 2019) the Concertgebouw will be the place to go for a wonderful family outing with your (grand)children. The entrance hall will be transformed into a big playground, with play and exploration areas. For a small fee, children can also enjoy a fun workshop. The varied offerings will have something for children of all ages. The Concertgebouw Circuit naturally remains a great attraction for families with children. We also have the family festival KRIKRAK and, as usual, a fine selection of family performances. Especially for 16 to 26 year-olds, the Concertgebouw has developed the format 7x7: seven performances that will definitely appeal to these youngsters, and each for only 7 euros. Season 18-19 promises to be a surprising exploratory journey through space, full of action and amazement, energy and attraction, lightness and gravity, silence and supernovas.